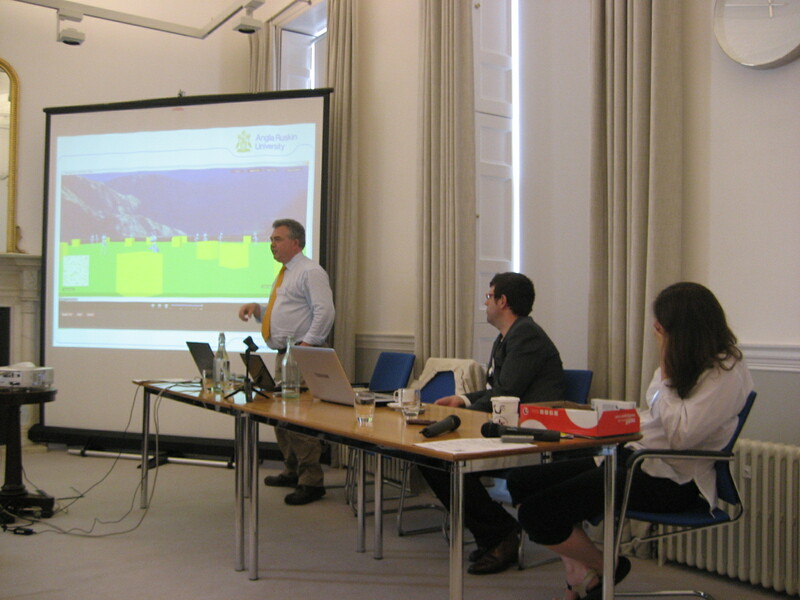 The Biomaths Challenges meeting was held on 28 June 2012 at the Nuffield Foundation in London. The event had been fully booked for several weeks: 48 people attended representing 23 different Higher Education Institutions (including ARU, Brunel, Bucks, Glasgow Cal, Cambridge, Middlesex, Rothamsted, Warwick, Kingston, UCL, UCS Ispwich, Bath, Birmingham, Bristol, Edinburgh, Hertfordshire, Leicester, Lincoln, Salford, Sydney, Westminster, UWE, Writtle College.) as well as a range of other organisations such as the London Mathematical Society, OCR, Nuffield Foundation, Oxford University Press, the Society of Biology, The Wellcome Trust and SCORE. The day began with a welcome from the organisers Dawn Hawkins (Anglia Ruskin) and Jenny Koenig (Cambridge) and thanks to the sponsors of the day, the Higher Education Academy, the Nuffield Foundation and Anglia Ruskin University. The East of England SIGMA hub were thanked for helping with travel costs of some of the delegates. Prof Ottoline Leyser CBE FRS (Chair of the BBSRC Bioscience Skills and Careers Strategy Panel and Associate Director of Sainsbury Laboratory at Cambridge University). The changing nature of bioscience research: mathematical and computational challenges. Professor Leyser pointed out that biology has always been quantitative and that maths and statistics have always been important. However recently very large data sets have become more pervasive and there is increasing interest in predictive modelling. There is a greater need to integrate maths within the biology curriculum. Dr Jenny Koenig (Lucy Cavendish College, University of Cambridge) gave an overview of recent reports that have been published relating to secondary school mathematics qualifications and the mathematics content of bioscience degree programmes in the UK. A summary document listed all of these reports with URL’s. Fiona Miller, (Project Manager at SCORE, Science Community Representing Education, http://score-education.org/home) gave a presentation on the recent SCORE report on the mathematics content of science A levels . The aims of this work were to gather evidence on the type, extent and difficulty of the mathematics assessed in science A-levels following concern about the use of mathematical assessments in science qualifications. Dr Toby Carter (Anglia Ruskin University) spoke about Using StarLogo TNG to introduce modelling and computer programming within a biosciences context. He began by describing a practical which demonstrated emergent behaviour, based (loosely) on nest building behaviour of Leptothorax ants. He also described the results of a collboration initiated by Anne Smith (St Andrews) which determining the effectiveness of StarLogo TNG as an introductory tool. 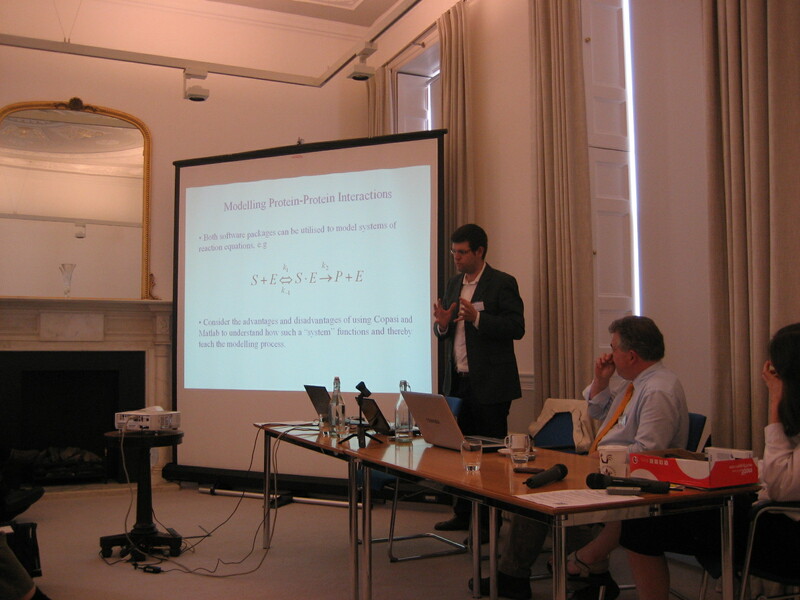 Dr Marcus Tindall (University of Reading) described his work on teaching modelling using simulation tools: examples using Copasi and Matlab. Marcus discusses the advantages and disadvantages of both software tools and his techniques for building the confidence of biologists in doing modelling. 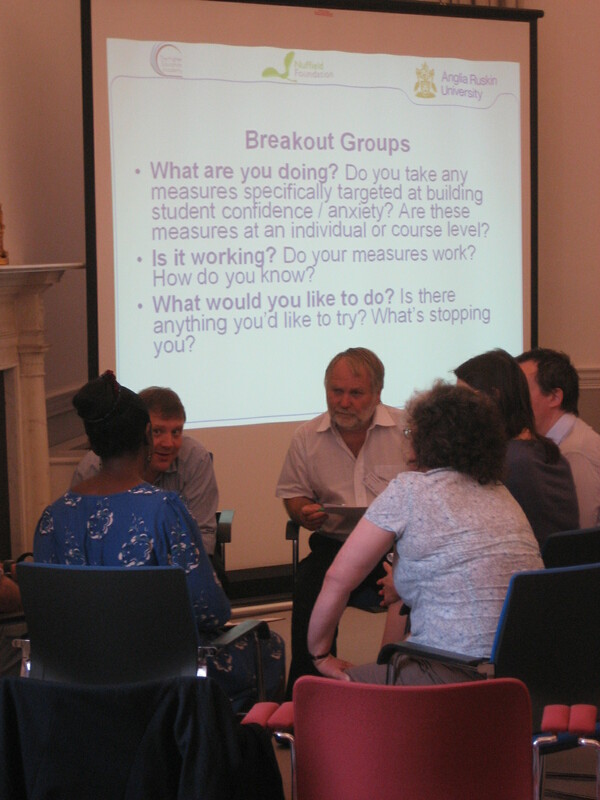 Dr Dawn Hawkins (Anglia Ruskin University) and Dr Hazel Corradi (University of Bath) led an interactive discussion session on building student confidence. Delegat es gath ered in small groups to discuss the techniques they have used to build student confidence. Issues surrounding e-learning, creating, re-using e-resources and diagnostic testing. After a superb lunch, Dr Jackie Willis (University of Hertfordshire) spoke about Enhancing mathematical skills of undergraduate science students using individualised assessment and feedback strategies to sustain learning . Her presentation described how they had moved from a weekly assessed tutorial sheet available on their VLE to “MyMathLab” provided by Pearson publishers and linked to a textbook “Foundation Maths for Biosciences” which is currently in development. application for biomaths . The questions (and answers!) are available at the mathcentre website http://www.mathcentre.ac.uk:8081/mathseg/ Each question has multiple “incarnations” and there is relevant feedback. The work is under a creative commons licence and so can be used and reused. Dr Jenny Koenig then led a discussion around the types of e-resources, how to find, use and create them. A number of “Clicker” questions were used to get the discussion started. Jenny was shocked to find out that 16 out of the 28 respondents (some present were not current teachers in HE) used a well-known search engine as their primary way of finding e-resources. The next most popular method was word-of-mouth (5/28) with repositories and collections coming equal last (2/28) tying with those linked to textbooks. 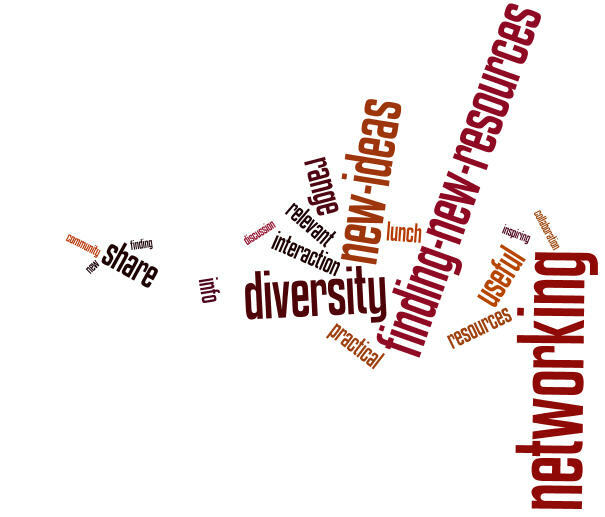 What do you want from the BioMaths Education Network? Finally Dr Jenny Koenig and Dr Dawn Hawkins led a discussion around the question: “What do you want from the BioMaths Education Network?” After a brief overview of the website we asked delegates to write down their answers for “What are the 3 main aspects of the website you’d value most?” The responses are summarised in the graph to the right. 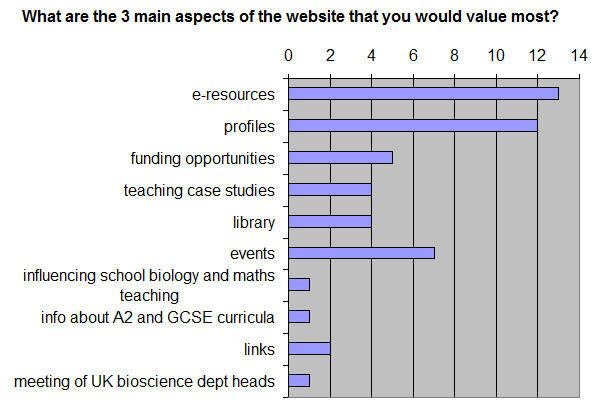 Popular responses were links and reviews of e-resources (to avoid having to use a major search engine perhaps?) 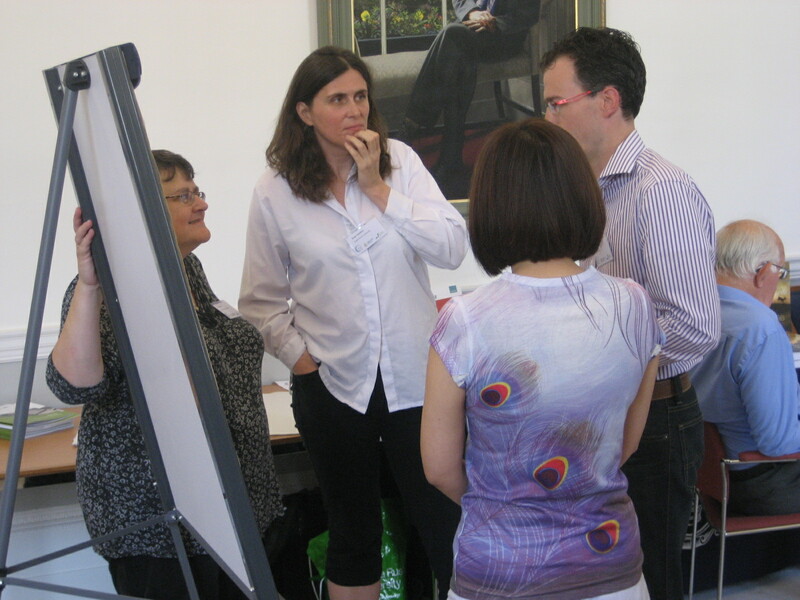 and personal profiles of network members to enable them to make contacts and establish collaborations with others. This was very useful information that we can use to develop this website further. Many thanks to all the participants for their constructive and helpful comments.